How often have you had a brilliant idea for your brand that would use Twitter, but you questioned whether you or your team could pull it off? 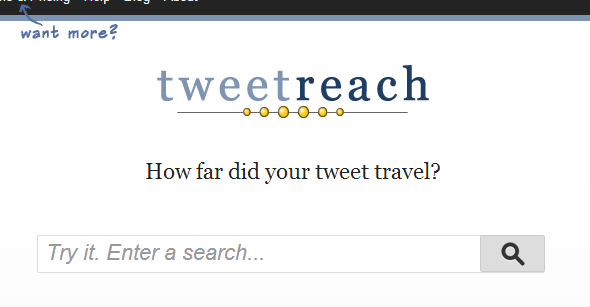 TweetReach answers all the above questions. It is one of the most interesting measuring tools, it tells you who is talking about you and how many people see your tweet, and who these people are, and in overall what your impact is on Twitter. TweetReach is very simple to use and instantly gives you analytics that give you the opportunity to get in-depth knowledge of your tweets, their reach, exposure, and the people who interact with them. For example, if you run a media event or a marketing campaign, you are able to monitor the discussion around it… and what does this give you? A better understanding of who you influence, and why. And if you know this, then you target the right people to get the results you expect. Most of all, the tool is not only for brands, but for anyone who wants to know how they influences Twitter’s world. Just enter your hashtag, your username or anything else, and track what is said about it, and how far it has gone!